Bob always stresses the importance of caring for and protecting finished surfaces of your motorcycle. 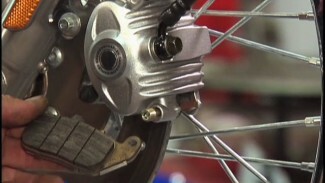 You never want to damage one area of your motorcycle while repairing or servicing another. Even when confident about performing a service/repair; it is always best to take preventive measures and protect your motorcycle front fender. In most cases, it will only be a matter of taking a couple of extra minutes to prepare. Those extra minutes can end up saving you a lot of money and aggravation if a mistake, or something unexpected should happen. Before Bob & Mark hang the motorcycle front fender, they always apply tape to the sharp, bottom edge of the slider “bells”. This is not just something for the cameras. This is a weekly shop practice. It is important to have a second set of hands when sliding the front fender up into position. The fender hardware should be prepped with blue Loctite. Start this hardware by hand, then snug evenly. Final tighten 16 to 20 ft lbs. Correctly route the fender tip harness in it’s original path and use ty-wraps to secure it to the front brake line and abs wire. Always take your time and work clean when handling painted or finished components. The extra time and care you take will help to assure that the job will be completed without incident.